Sorrel is a leafy green vegetable that looks a lot like spinach. One of the main ingredients in sorrel is oxalic acid, which gives it its acidity and prominent taste. 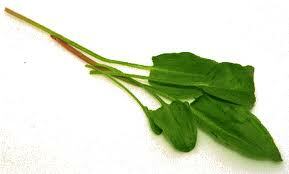 Cancer: The flavonoids found in the sorrel plant are good deterrents against particular types of cancers. These flavonoids help in destroying cancer cells in the body and prevent further spread of this disease. They are also helpful in strengthening the immune system. Sheep sorrel in particular is a good natural cure for cancer. 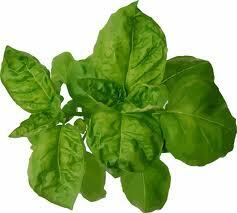 It contains oxalic acid and chlorophyll that are both effective in fighting cancer. Hair: Sorrel is also a good natural treatment for dry and damaged hair. It is widely used in commercial hair care products for this very reason. Experts believe that sorrel can also help control balding when applied regularly to bald patches. Sorrel is also effective in curing scorbutic and inflammatory diseases. Both its leaves as well as seeds are used as food and a seasoning. 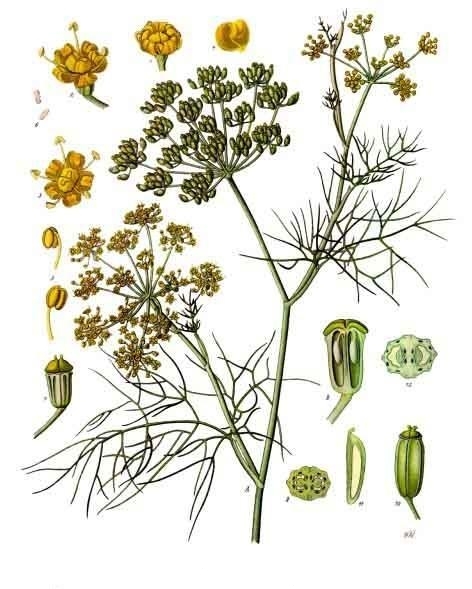 It is the member of the Umbelliferae family, a large group of flowering herbs and spices, which includes caraway, parsley, cumin and fennel. Dill contains numerous plant derived chemical compounds that have anti-oxidant, disease preventing, and health promoting properties. It is contains many anti-oxidants, vitamins like niacin, pyridoxine etc, and dietary fibers which help to control blood cholesterol levels. 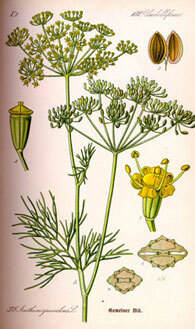 Dill leaves (sprigs) and seeds contain many essential volatile oils such as d-carvone, dillapiol, DHC, eugenol, limonene, terpinene and myristicin. Dill oil, extracted from dill seeds has anti-spasmodic, carminative, digestive, disinfectant, galactagogue (helps breast milk secretion), sedative properties. It is also rich in many vital vitamins including folic acid, riboflavin, niacin, vitamin A, ß-carotene, vitamin-C that are essential for optimum metabolism. Vitamin-A and beta carotene are natural flavonoid antioxidants. 100 g of dill weed sprigs provide 7718 IU or 257% of recommended-daily levels of this vitamin. Vitamin A is also required for maintaining healthy mucus membranes and skin and is essential for vision. Consumption of natural foods rich in flavonoids helps protect from lung and oral cavity cancers. Fresh dill is an excellent source of antioxidant vitamin-C. 100 g contain about 85 g or 140% of vitamin C. Vitamin-C helps body develop resistance against infectious agents and scavenge harmful, pro-inflammatory free radicals. It’s a good source of minerals like copper, potassium, calcium, manganese, iron, and magnesium. Copper is a cofactor for many vital enzymes, including cytochrome c-oxidase and superoxide dismutase (other minerals function as cofactors for this enzyme are manganese and zinc). Zinc is a co-factor in many enzymes that regulate growth and development, sperm generation, digestion and nucleic acid synthesis. Potassium is an important component of cell and body fluids that helps control heart rate and blood pressure. A time comes in your life when you finally get it … When, in the midst of all your fears and insanity, you stop dead in your tracks and somewhere the voice inside your head cried out … ENOUGH! Fighting and crying and blaming and struggling to hold on. Then, like a child quieting down after a tantrum, you blink back your tears and begin to look at the world through new eyes. This is your awakening. You realize it’s time to stop hoping and waiting for something to change or for happiness, safety and security to magically appear over the next horizon. You realize that in the real world there aren’t always fairy tale endings, and that any guarantee of “happily ever after” must begin with you … And in the process a sense of serenity is born of acceptance. You awaken to the fact that you are not perfect and that not everyone will always love, appreciate or approve of who or what you are … And that’s OK. They are entitled to their own views and opinions. You learn the importance of loving and championing yourself … And in the process a sense of newfound confidence is born of self approval. You stop complaining and blaming other people for the things they did to you – or didn’t do for you – and you learn that the only thing you can really count on is the unexpected. You learn that people don’t always say what they mean or mean what they say and that not everyone will always be there for you and that everything isn’t always about you. So, you learn to stand on your own and to take care of yourself … and in the process a sense of safety and security is born of self-reliance. You stop judging and pointing fingers and you begin to accept people as they are and to overlook their shortcomings and human frailties … And in the process a sense of peace and contentment is born of forgiveness. You learn to open up to new worlds and different points of view. You begin reassessing and redefining who you are and what you really stand for. You learn the difference between wanting and needing and you begin to discard the doctrines and values you’ve outgrown, or should never have bought into to begin with. You learn that there is power and glory in creating and contributing, and you stop maneuvering through life merely as a “consumer” looking for your next fix. You learn that principles such as honesty and integrity are not the outdated ideals of a bygone era, but the mortar that holds together the foundation upon which you must build a life. You learn that you don’t know everything, it’s not your job to save the world and that you can’t teach a pig to sing. You learn that the only cross to bear is the one you choose to carry and that martyrs get burned at the stake. Then you learn about love. You learn to look at relationships as they really are and not as you would have them be. You learn that alone does not mean lonely. You stop trying to control people, situations and outcomes. You learn to distinguish between guilt and responsibility and the importance of setting boundaries and learning to say NO. You also stop working so hard at putting your feelings aside, smoothing things over and ignoring your needs. You learn that your body really is your temple. You begin to care for it and treat it with respect. You begin to eat a balanced diet, drink more water, and take more time to exercise. You learn that being tired fuels doubt, fear, and uncertainty and so you take more time to laugh and to play. You learn that, for the most part, you get in life what you believe you deserve, and that much of life truly is a self-fulfilling prophecy. You learn that anything worth achieving is worth working for and that wishing for something to happen is different to working towards making it happen. More importantly, you learn that in order to achieve success you need direction, discipline and perseverance. You also learn that no one can do it all alone, and that it’s OK to risk asking for help. You learn the only thing you must truly fear is fear itself. You learn to step right through your fears because you know that whatever happens you can handle it, and to give in to fear is to give away the right to live life on your own terms. You learn to fight for your life and not to squander it living under a cloud of impending doom. You learn that life isn’t always fair, you don’t always get what you think you deserve and that sometimes bad things happen to unsuspecting, good people… And you learn to not always take it personally. You learn that nobody’s punishing you and everything isn’t always somebody’s fault. It’s just life happening. You learn to admit when you are wrong and to build bridges instead of walls. You learn that negative feelings such as anger, envy and resentment must be understood and redirected or they will suffocate the life out of you and poison the universe that surrounds you. You learn to be thankful, and to take comfort in many of the simple things we take for granted, things that millions of people upon the earth can only dream about: a full refrigerator, clean running water, a soft warm bed, a long hot shower. Then, you begin to take responsibility for yourself, by yourself, and you make yourself a promise to never betray yourself and to never, ever settle for less that your heart’s desire. You make it a point to keep smiling, to keep trusting, and to stay open to every wonderful possibility.